WE SELL THE DREAMS, YOU BUILD THE MEMORIES! 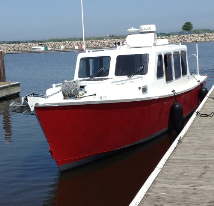 The Eco-Trawler is a 33-foot welded aluminum full displacement trawler. By the use of ideal proportions and perfect ratios, a most successful hull form has been established. Rigid adherence to these principles has resulted in a most kindly sea boat with excellent stability together with economy of operation. According to the American Chemical Society, “aluminum is light, strong, corrosion‐resistant, nonmagnetic, non-toxic and naturally good-looking” making it the most eco-friendly material to use in boat building. It is the third most common element in the Earth’s crust. The welded aluminum construction makes it very strong and safe. Designed with an 8-foot beam, it is legally trailerable anywhere in the US and weighing approximately 7,000 pounds it can be pulled with a modest tow vehicle. The Eco‐Trawler is powered by the latest generation of quiet, clean‐running, fuel efficient outboard motors. There is an emphasis on advanced reliability and low maintenance. Salt water protection is delivered by using stainless steel parts, highly engineered painting, and easy to use fresh water flush. 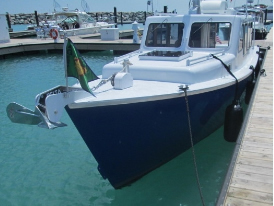 The blue Eco-Trawler is powered by a Mercury 115 hp and the red one has twin Evinrude E-Tec 50 hp outboards. There are no thru‐hulls on the boat also making it very eco-friendly. Much thought and research was given to the components that keep the systems as simple as possible and yet afford the creature comforts that most of us want in a boat. 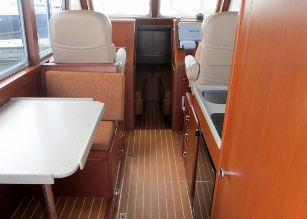 Some of the options available are pictured here such as deluxe captain chairs, electronics packages, galley, enclosed stand-up head with marine composting toilet, shower, thick custom‐made mattresses, heat & air-conditioning, and LED TV. These pictures were taken on the blue Eco-Trawler. 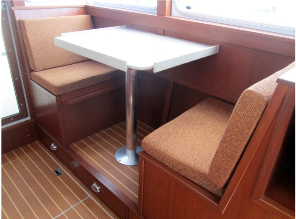 The red Eco-Trawler was designed to include a dinette so the galley is moved to the starboard side as shown in these pictures. More detail of both of these layouts can be seen in the Trawlers For Sale listings. A large cockpit allows an outdoor living area for lounge chairs and additional storage areas. 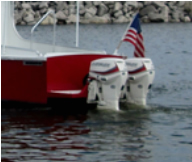 Numerous handholds and cleats, non-skid decking, plus a swim platform and ladder, provide the necessary safety designs for easy boarding and docking. The custom-designed aluminum ladder stores on the starboard side of the cockpit and can be easily moved to the swim platform. Both layouts include an electric windlass. The blue one has the standard windlass with an anchor locker in the bow. The red one has a drum windlass thus eliminating the anchor locker and providing extra storage space in the forward cabin. The Eco‐Trawler is designed by Don O’Keeffe, Naval Architect. It is built to the standards required by the American Bureau of Shipping (ABS). All systems have been installed to the American Boat & Yacht Council (ABYC) standards. The Eco‐Trawler is the answer to those who are looking for more efficiency, less draft, easy maintenance, and more fun on the water. 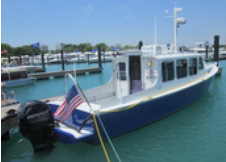 Trawlers Midwest is the sole dealer for the Eco‐Trawler throughout the United States and Canada. Contact Trawlers Midwest for more details. This page and all contents are Copyright © 2016 by Trawlers Midwest Inc.